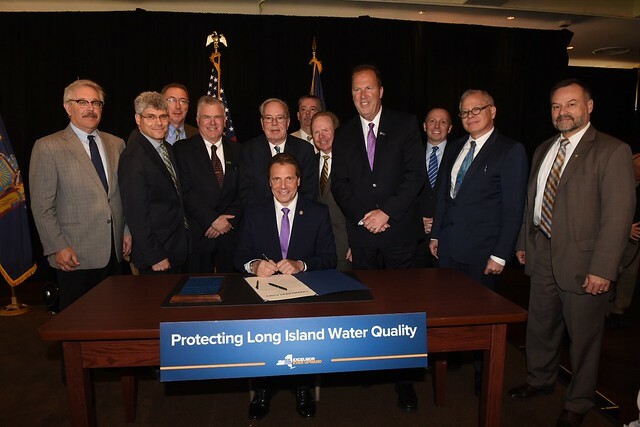 Governor Andrew M. Cuomo today signed the Clean Water Infrastructure Act – a $2.5 billion investment in drinking water infrastructure, clean water infrastructure and water quality protection across New York. This bold investment builds on the Governor's record of environmental leadership and will help local governments pay for local infrastructure construction projects, address water emergencies, and investigate and mitigate emerging contaminants to ensure access to clean, drinkable water for all New Yorkers. This includes over $1.5 billion in grants for water infrastructure improvements and creates a $75 million rebate program to give homeowners and small businesses an incentive to replace and upgrade aging septic systems. In addition to traditional infrastructure, funds are also available for 'green' infrastructure, with $110 million dedicated ​for source water protection initiatives, including land acquisition. "Clean water is an issue of paramount national importance, and New York is once again leading the nation with this bold investment to strengthen the infrastructure of our water systems and protect the long-term health, sustainability and economic vitality of communities across the state," Governor Cuomo said. "This funding will provide New York’s cities, towns and villages with modernized, sustainable water systems – protecting our precious resources and securing a healthier future for all New Yorkers." The Governor also announced that municipalities can now apply for $255 million in grants for drinking water and clean water infrastructure projects through the established NYS Water Grant Program and new Intermunicipal Grant Program, funded though the Clean Water Infrastructure Act.​ Applications and additional information are now available here and must be submitted along with any required supporting documentation to: [email protected] by 5:00 p.m. on June 23, 2017. $900,000 to protect the Long Island South Shore Estuary Reserve. The FY 2018 State Budget invests $40 million to build two local water treatment systems that provide vital support to the continued growth of the region. First, the $20 million Smithtown Business District Sewer Improvement Area project will install sanitary infrastructure in the business district. Additionally, a $20 million Kings Park Wastewater Treatment Facility be installed in the 100-acre, 140 lot central business district area adjacent to a railroad station. The FY 2018 Budget invests $5 million for Suffolk County and the Stony Brook Center for Clean Water Technology to develop and evaluate new cost-effective treatment technologies to remove emerging contaminants from drinking water. The initial focus will be on researching and developing treatment technologies to remove the emerging contaminant 1,4 dioxane, which has been found in Long Island groundwater and is not readily removed by traditional drinking water treatment technologies. The FY 2018 Budget establishes the Drinking Water Quality Council to identifies strategies to address emerging threats to water quality. Eight of the twelve Council members are to be appointed by the Governor, including the DOH and DEC Commissioners, as well as an additional representative from DOH and DEC. The remaining four members appointed by the Governor will include a water purveyor representative, a toxicologist/risk assessor, a microbiologist and an environmental engineer.​ Two each are recommended by the Senate and Assembly representing water purveyors and a member with a background in toxicology or risk assessment. The federal government currently only requires testing for unregulated contaminants for water systems serving 10,000 residents or more. The FY 2018 Budget includes legislation requiring that all public water systems in New York State, including smaller systems not covered under the current federal rule, test for emerging contaminants, like 1,4-dioxane, PFOA and PFOS. The Department of Health will provide financial assistance for the testing to small public water systems that demonstrate financial hardship. This funding will provide NY’s cities, towns and villages with modernized, sustainable water systems – protecting our precious resources and securing a healthier future for all NY'ers. Last year, DEC declared the Gabreski Air National Guard Base in Suffolk County a Superfund Site due to historic use of PFOS-containing firefighting foam. With this designation, DEC identified the U.S. Department of Defense, which oversees the site’s operations, as the potentially responsible party for perfluorooctanesulfonic acid contamination detected in nearby groundwater supplies. DEC, in partnership with the Suffolk County Water Authority, is connecting homes on vulnerable private wells to the clean public water supply. DEC is taking aggressive action to hold the Department of the Defense accountable for a comprehensive site cleanup. At Governor Cuomo's direction, the Department of Environmental Conservation is pursuing an immediate engineering investigation to expedite containment of the groundwater plumes contaminated with industrial solvents at the U.S. Navy and Northrop Grumman Bethpage site in Nassau County. The investigation assesses expedited cleanup options, including full containment of the plumes, in order to ensure the contamination does not threaten additional drinking water wells. These new aggressive actions are part of New York’s ongoing efforts to hold the polluters accountable and utilize state Superfund resources to address the movement of groundwater contamination. In August 2016, Governor Cuomo announced New York's intention to fight the EPA's designation of the Eastern Long Island Sound Disposal Site. The EPA finalized the designation in December 2016 and, immediately thereafter, New York State issued a Notice of Intent to Sue under the Ocean Dumping Act. Governor Cuomo announced today that the State will file the complaint challenging the EPA's rule next month. This lawsuit will be the strongest in a series of actions taken by New York State over many years to oppose the unabated disposal of dredged material in Long Island Sound. The FY 2018 Budget investment builds on the $388 million initiative launched in 2014 to connect 10,000 homes from septic systems to sanitary sewer systems in the Carlls River, Connetquot River and Patchogue River, and Forge River watershed areas and southwest Suffolk County’s Sewer District #3. Treated sewage from the Bay Park treatment plant has been impacting Nassau County's Western Bays for decades. New York State is now working with Nassau County to evaluate the feasibility of diverting treated wastewater from the Bay Park treatment plant to the Cedar Creek treatment plant and its ocean outfall. By utilizing an existing, unused aqueduct, this innovative solution would be significantly faster and more cost-effective than the initial proposal to construct a new outfall pipe at Bay Park. In order to further protect the groundwater resources on Long Island, the Governor has directed $6 million to study the effective management of this finite resource. The study, in partnership with the U.S. Geological Survey and Nassau and Suffolk Counties, will drill wells, analyze water chemistry, and gauge quantity. This assessment will provide new solutions for addressing critical threats like saltwater intrusion.